AXIS TIE-IN! - Marvel's most honest and upright hero -- now in his own magazine! 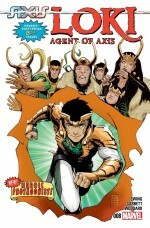 - With a quip on his lips and a song in his merry heart, Loki continues his dashing quest for truth, justice and the Asgardian Way! - Guest-starring -- the Enchantress! And some other people who think Loki's "changed" somehow. BUT MOSTLY, THE ENCHANTRESS!